5.11 Tactical’s Cable Hiker Carbon Tac offers protection with good looks and still is a real hiking boot giving you good traction. I was fortunate enough to have the support of several folks who made sure several items arrived in time for this issue. That meant they had sent items promptly after SHOT was over. Thank you all. Unfortunately we are in the midst of a nasty winter so I could not put these boots through a lot of wear testing. If it was not brutally cold out, it was snowing or raining. I did not want to take a spill seeing how the boots feel. However, we did get a few breaks so I could get out and give them abbreviated workouts. Interceptor Frontier is a true value priced boot that will serve shooters, hunters, hikers and troops without breaking the bank. First up was 5.11 Tactical’s (Phone: 866-451-1726; Online: 511tactical.com) Cable Hiker Carbon Tac. 5.11 Tactical has been offering boots for duty, hiking and range use for well over a decade. 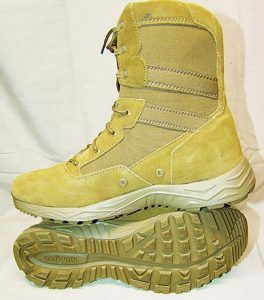 Over the last half-dozen years 5.11 has started building boots for shooters, hunters and hikers using the technology and proven designs in their duty/uniform line. The Cable Hiker Carbon Tac Toe is one of first boots available for 2019. I am not a fan of protective hard toes, because I had to wear steel toed boots for a position I had when I first left the service. Back in the early nineties there were very few choices for protective toes; pretty much steel toes were it. Those of you who have worn steel toes know they are heavy, hot in the summer and cold in the winter. Neither of these factors makes you want to wear protective toes unless they are required. Even non-metallic toes were not the most comfortable because they were just as heavy and uncomfortable as steel toes. Fortunately non-metallic toes have made great strides in comfort. They have also started meeting various industrial safety standards. Both of these factors have led more folks in both industrial and non-industrial settings to start wearing them. 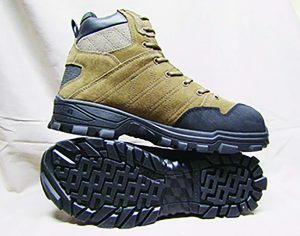 5.11’s Cable Hiker Carbon Tac (CHCT) is one of the boots that I would call a leader in the non-industrial market. Because of their heritage, they are also a boot I would suggest to you: the readers. 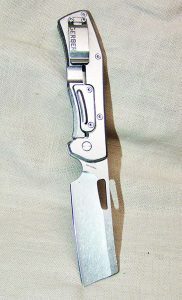 This is Gerber’s FlatIron, the matte gray side showing the “cleaver” style blade. The other major factor that makes the CHCT attractive to the end user is, first it is a hiking boot, not a protective boot masquerading as a hiking boot. What this means is you get a hiking boot with a 30mm thick with 10mm of EVA for cushioning and a 16mm forefoot. When you have these thicknesses or the forefoot to heel ratio of approximately a half inch, your feet and legs do not get fatigued like they do in boots that have nearly zero heel lift. You can see this heel lift when you look at the CHCT. This clip should keep the FlatIron secure through almost any activity. To further aid in comfort 5.11 uses their time tested Ortholite insoles. Ortholite does not crush down like many other materials used in insoles. It offers a high degree of shock absorption without adding addition weight. Another feature of the CHCT is the Speed Urban outsole. This sole is non-marking, slip- and oil-resistant. I found it gives good traction in the snow and ice of the Polar Vortex that greeted me when I returned from the SHOT Show. If I was not slip sliding away in that mess, I am sure the CHCT will be surefooted in all but the worst conditions on the range or in the field. Overall 5.11 Tactical’s Cable Hiker Carbon-Tac is a comfortable solid boot. With the protective carbon toes cap, I can see this boot becoming a favorite of a match’s “Mr. Fix-it”. The toe cap will undoubtedly save toes from dropped tools, parts for props or other heavy surprises that could cause a major ouch on the range or in the field. The only thing the CHCT lacks is a waterproof membrane, but that will add additional cost to the $139.99 MSRP. Even without this, I still would recommend 5.11 Tactical’s Cable Hiker Carbon Toe if you are looking for protective footwear for the range, field or daily wear. The other boot that caught my eye was Interceptor’s Frontier Tactical Boot. The Frontier is AR 670-approved. Too many old Vets being “Army approved” might make you think of those black recruit boots we wore in the sixties through the early nineties. Today this standard means boots must meet certain standards for color, shock absorption, wear and comfort; not just be the cheapest black boot the Army can buy. While looking at the Frontier (Online: walmart.com) my initial thought was it feels like a comfortable running shoe with a boot shaft. The boot is flexible, lightweight, offers good support and the aggressive outsole should give good traction. The sole wraps up the toe so you can get an aggressive toe off when running in them. 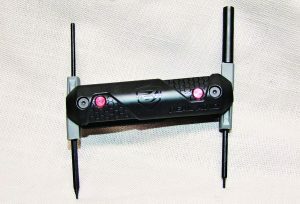 Real Avid’s 4-in-1 Glock Tool with all the tools extended. A closer look at the boot revealed the midsole to be polyurethane. This is generally a material used in vastly more expensive boots, not something I would expect to see in a boot selling for $43.23 at Walmart. Polyurethane reduces weight while giving good shock absorption. Coupled with Enduro Pro Anti-Fatigue foot bed, the end user should have all day comfort. For good or bad with my beat-up knees I quickly notice when boots do not offer good shock absorption. I was able to walk a couple miles a day when we had a few decent days here. I was not achy or worn-out so the Frontier gets two thumbs up. The upper of the Frontier is nylon and suede. The ankles have stability strips that wrap around the ankles. This allows you to snug the boot up to help prevent rolling your ankle. There are air vents in the arch area of the boot to keep your feet comfortable in hot weather. Overall I was impressed with both 5.11 Tactical’s Cable Hiker Carbon Tac and Interceptor’s Frontier Tactical Boot. If I were the “Mr. Fix It” for a club or major match, I would wear the CHCTs. They would save the toes from dropped hammers, dropped steel plates etc. For those who are looking for a value priced uniform boot or responsive boot for shooting in; Frontiers are an excellent choice. The other two items that caught my eye are from Gerber (Phone: 800-95-6161; Online: gerbergear.com); the FlatIron Knife and Center-Drive Plus pocket tool. These two items are both innovative and will serve you well in any number of ventures. When closed the Glock 4-in-1 Tool is an easy to carry tool that will keep your Glock running. While I have seen clip-it knifes of all shapes and sizes, I have never seen one with a “cleaver” style blade. Although drop point blades and tanto knifes are great for slashing, what would you do if you need to actually cut meat or vegetables for dinner in the field. A cleaver style blade makes this task much easier. Because of the design you also have greater tip control for dressing game and the flat blade allows you to make long cuts such as when caping a rack. The FlatIron is easily opened with one hand thanks to the slot in the 3.8” blade. To make the knife corrosion resistant 7Cr17MoV steel is used. This version of chrome-moly steel is easy to sharpen and it holds an edge. Another feature of the FlatIron I liked is you can get the side opposite the liner lock in gray for $39 and flat earth for $45. This is a nice touch over all black or the various metallic shades. It gives the functional FlatIron a unique look. Gerber is constantly bringing new knives to market designed to meet the needs of chefs, hunters, armed professionals and anyone who needs a solid, affordably-priced knife. It is easy to overlook another part of the market for which Gerber has offered many innovative items: pocket tools. Many years ago Gerber introduced the Multi-plier family of tools. What sets the Multi-pliers apart from other tools is their one-handed opening. Grasp the handles, push the sliding lock, and flick the tool head and the spring loaded pliers end pops out. You are ready to use them. Gerber’s Center Drive Plus showing all the tools you have in a compact package. This year Gerber improved on the Multi-plier with the Center Drive family. The Center Drive addresses one of the biggest complaints about pocket tools: the screwdriver is off center making it difficult to drive screws. Gerber put the blade holder on a tool arm that opens into the center of the tool. 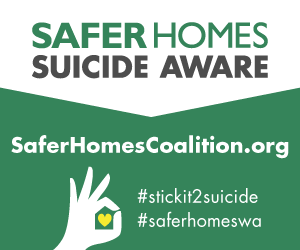 This allows you to apply even pressure to a screw, reducing the time needed to install/remove a screw and reducing the odds of stripping its head. Gerber ensures the tool arm stays in place by using a liner lock. The tool head is magnetic and will hold standard ¼” tools. Included tools are Philips head, Torx, flat blade, square bits and hex drivers that will fit common firearm’s screws. We chose to look at the $144 Center Drive Plus with tools. This tool comes with 14 bits that fit into a slot in the leather carrying case. The blades are a drop point combination blade, a fine/coarse file, a pry bar/nail puller/bottle opener, scissors and punch. The pliers are spring-loaded needle nose with replaceable carbide cutters. Unlike many pocket tools, each side of the pliers is shaped sloped to give added strength to each blade. The pliers open wide enough to easily handle a ¾” nut and the serrations ensure you a solid grip on it. Two easily overlooked features of the Center Drive Plus are the lanyard loop, tool lock and grip support. This is the black sliding piece on the blade side of the Center Drive. When a blade is extended, you slide this to the front of the tool to release the blade. The lanyard loop is at the very end of the lock. If you do a lot of work on ladders, a lanyard loop can be invaluable to keep you from climbing up and down when you drop the tool. The lock also acts as a grip aid to keep you from slipping when grasping or screwing bits with the Center Drive. 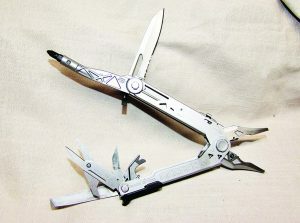 While Gerber was not the first to enter the pocket tool market they have been the most innovative. From the single-hand opening and now the Center Drive, Gerber has built tools with the end user in mind. The Center Drive Plus is the latest in Gerber’s pocket tools; I plan to keep it in my match bag for field repairs or anything else I might need to fix on the fly. The last item we are going to look at is another pocket tool from our friends at Real Avid (Phone: 800-286-0567; Online: realavid.com). This tool is specifically for Glocks: the 4-in-1 Glock Tool. Why a tool specifically for a Glock? It is simple: these pistols are simple and only require a few tools to maintain them. You can see all the extra blades and why it is called the Center Drive: The screwdriver is in the center of the tool to give you better control and torque. You need a wrench for the front sight, a tool to pry out the locking block/adjust Glock target sights, a pin punch to push out the two or three pins and one to install aftermarket rear sights. Real Avid puts all four of these into a $24.99 pocket tool. Each tool is released by a push button. When I was working with the Gen 5 G19 (Women&Guns June18) I used the 4-in-1 to replace the OEM sights. It fit the screws perfectly. I tested is it on the pins and it fit the pin holes like a glove. Real Avid hit another home run with the Glock 4-in-1 Tool. While brief I hope this article gives you a bit of insight to where the industry is heading in 2019. You will see more technical clothing and footwear to keep you comfortable in the field and on the range. There are more quality affordable knives for general purpose use. Companies are offering innovative tools to maintain your firearms, plus optics and other gear. I think 2019 will be a good year for the consumer and the manufacturers because the latter is listening to the former. Look for other articles on new soft goods and various pieces of kit. 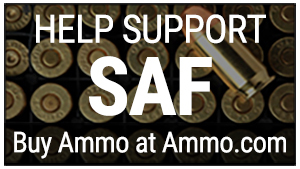 They will make your trips to the range safer, allow you to shoot better and have fun doing it.